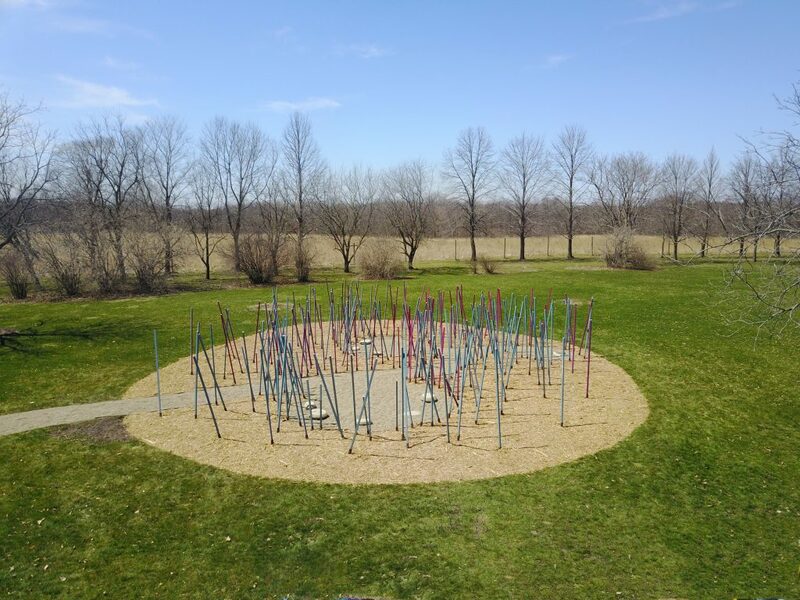 BLUESTEM explores the concept of ‘field condition’ through the design and construction of a permanent installation at the Iowa Arboretum in Madrid, Iowa. ‘Field condition implies an architecture that admits change, accident, and improvisation’ and which ‘leaves space for the uncertainty of the real.’ (Allen, 1996) The project was computationally designed and then constructed by a team of fourteen undergraduate students majoring in architecture, landscape architecture, and interior design. Through iterative prototyping, full-scale mock ups, computational studies, and digital fabrication, the project examined the potential of integrating computation into construction practice. In pursuit of this idea design explorations began with the imposition of a bounded grid of evenly spaced poles at the threshold between the walking path and the unprogrammed southwestern corner of the main campus. 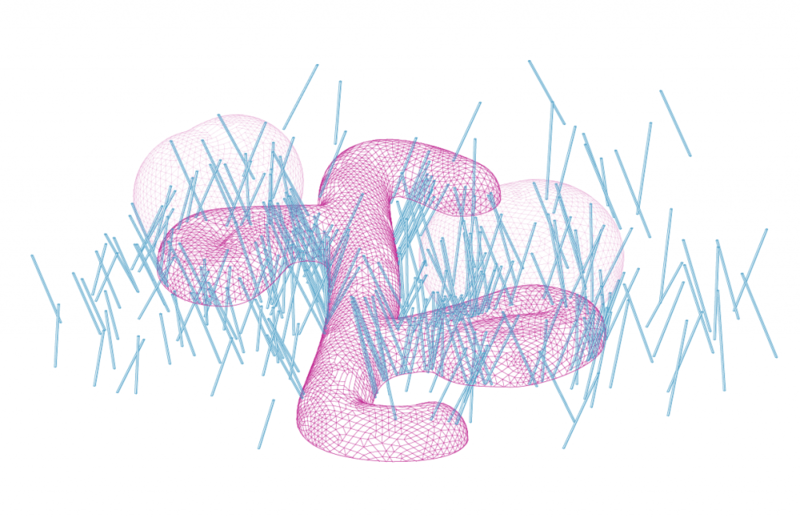 The design then developed through the notion of ‘loose fit’ between activity and enclosure via computational methods. The overall form of the project consists of a cloud-like volume which contains three gathering spaces. Circulation paths and the void-like ‘rooms’ were drawn from site specific characteristics such as the existing pathways, trees, views, and topography. These paths and voids were then used to cull and disrupt the grid within the cloud. The result of these operations is a field of two hundred tall, thin poles occupying a base of mulch and a path of pea gravel. 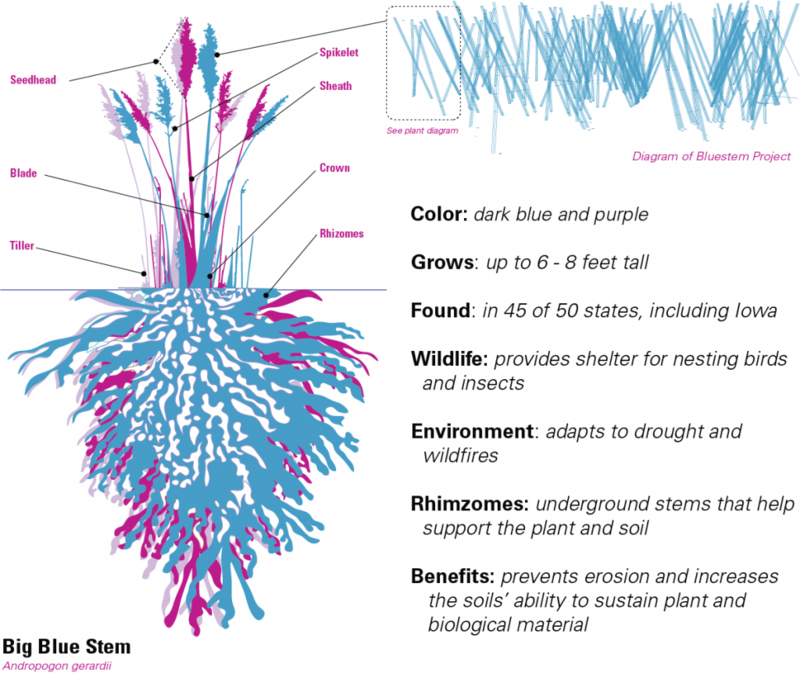 The palette is inspired by colors from the adjacent fields: shades of magenta and aqua define the lengths of the poles, while a lighter pink marks the top face, signifying the seed heads of the grasses. Each pole is painted to emphasize wayfinding and to define internal spaces and clusters of seating, with the magenta side of each pole turned to face the nearest path or room. The poles meet the ground at varying angles and orientations, creating a moiré effect and a feeling of movement reminiscent of tallgrasses swaying in the wind. Although the project was designed parametrically, the site pushed back against the imposition of “perfect parametrics”: snow, mud, rain, and frost resisted, and then relented, to the planting of this new type of tallgrass. Visitors to this space will know little of computational discourse or whether the results reflect the original digital intention. 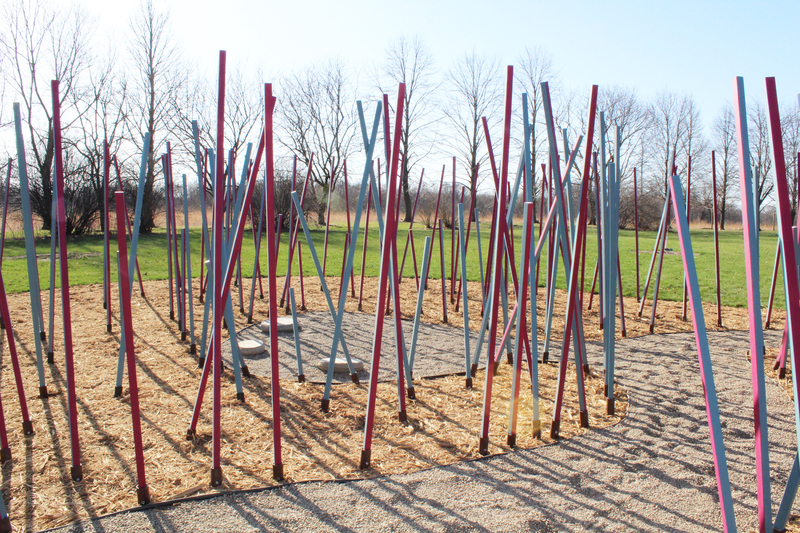 Instead, the computational residue of BLUESTEM is a field of sensory experience which recalls and reveals the history and values reflected in patterns of settlement, technology, ecology, and human impact: the crunch of gravel, smell of mulch, swaying of poles, and moiré of shadows and light.